Not very much has happened today outside failing my mechanics exam and making a poster for my 5SOS concert with my sister (I’ll put pictures up of it once I’ve been to the concert, I don’t want people stealing my idea!) so I’ve not been overwhelmingly inspired to write anything today. However, I was just browsing through my Facebook page and I ‘like’ the Facebook page of Adam Elmakias, a photographer who has worked very closely with bands like All Time Low and Pierce The Veil and basically has my dream job. 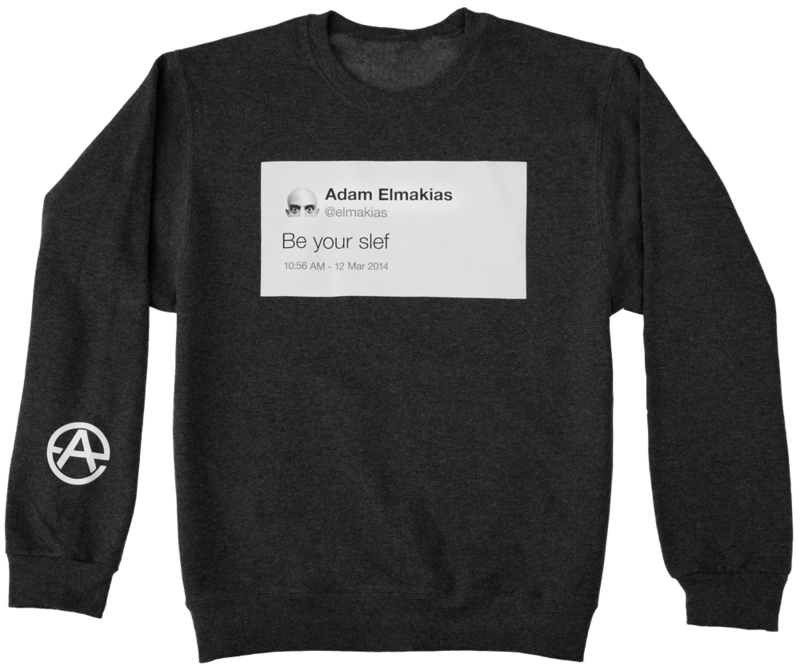 I love the guy – he’s so, so talented and he’s hilarious and I never realised he had a merch page. I’m a sucker for a sweatshirt – I love pulling them over my hands and I love baggy clothes, I hate tight fitting clothes and I love sweatshirts with slogans on and this entertains me so much. It’s just fun to say. ‘Be your slef’, I’m giggling just writing it. But it’s $38 I don’t have and I don’t really need it… but my dad just did the whole ‘you’ve been stressed with exams, I’ll give you the money if you want’ thing, and I might have to take him up on it. Sorry for a short post, you’ll get much longer ones when I go to the 5SOS concert this weekend!